I'm sure most of you have purchased Borderlands, Borderlands 2, and the ridiculous amount of accompanying DLC or season passes. If you haven't, what the hell is wrong with you? Are you against fun? Maybe you should see a doctor. Or maybe you've been waiting for the right price. Well, you're in luck, traveler! Amazon's downloadable Borderlands Bundleganza for PC includes both of the main campaigns and all eight add-ons for the criminally low price of $21.99. That's hundreds of hours loot and shoot content for the price of--hell I don't know--about half the price of the new Deadpool game. I'm not going to tell you how to spend your money, but I've played Deadpool. I'd go with the Bundleganza. Borderlands Game of the Year Edition. 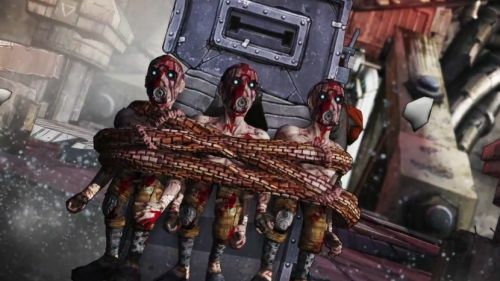 - This will include these add-ons: "The Zombie Island of Dr. Ned," "Mad Moxxie's Underdome Riot," "The Secret Armory of General Knoxx," and "Claptrap's New Robot Revolution." Borderlands 2 and it's respective DLCs, including "Captain Scarlett and Her Pirate's Booty," "Mr. Torgue's Campaign of Carnage," "Sir Hammerlock's Big Game Hunt," and the recently released "Tiny Tina's Assault on Dragon Keep." We should have our co-op impressions on the final addition to the season pass tomorrow. This offer is good through July 14. You will need the Steam client to activate the games, but chances are you already have it. I should note this will NOT include the Mechromancer or Psycho Bandit character packs. You'll have to pony up $4.99 each for those extras. Personally, I'm a little burnt out on the zany hijinks of the Pandoran Vault Hunters, but I hear this new Tiny Tina DLC is one of the best add-ons the developers at Gearbox have ever produced. It might be time to knock the dust off of my Gunzerker. Page created in 0.4111 seconds.